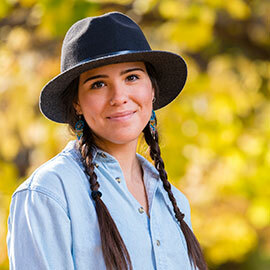 Tunchai Redvers is in the first semester of her Master of Social Work (MSW) program at Laurier, and she's already finding ways to link her schooling to a grand initiative. Born and raised in Hay River, Northwest Territories, Redvers is the co-founder of We Matter — a national video and social media campaign designed to share messages of positivity and inspiration to Indigenous youth struggling with suicidal thoughts and other hardships. “My brother Kelvin, who is a filmmaker in Vancouver, and I conceptualized the initiative in the spring and launched in October,” says Redvers. “A social worker and filmmaker who identify as First Nations — put the two together and you have a vital media campaign for Indigenous youth,” she says. Redvers sees a direct correlation between We Matter and her social work studies at Laurier. This combination, Redvers says, is what the campaign is all about. “We’re advocating for Indigenous youth, suicide awareness and prevention, but we’re also building resilience and coping mechanisms,” she says. The campaign is based on the model used by the It Gets Better Project, which employed multimedia to communicate positive and inspiring messages to lesbian, gay, bisexual and transgender youth around the world. Over the summer, Redvers and her brother conducted community outreach with Indigenous youth in northern Ontario, British Columbia, the Northwest Territories and Northern Alberta. Redvers and her brother have registered We Matter as a non-profit organization and are awaiting charitable status. “Finding law, accounting and marketing firms, while reaching out to form networks and find funders — it’s been quite busy as a full-time grad student, but all very exciting,” she says. “Our grandma grew up in a residential school — and growing up in Hay River, the issues that Indigenous communities and youth across Canada face are not foreign to my brother and me,” says Redvers. She points to the 100 suicide attempts in one year in Attawapiskat, Ontario, and the six Indigenous girls who committed suicide in Saskatchewan in October, as proof of the crisis for Indigenous youth in Canada. “We grow up surrounded by negative images from the media and in our community,” she says. “From alcohol and drug addiction to intergenerational trauma and the loss of cultural identity, it’s what we grew up with. “It’s so disheartening and overwhelming to keep hearing about these things. So Kelvin and I started the idea for We Matter,” says Redvers. The campaign is a natural extension of Redvers’ social justice and community-engagement activities, which began in high school and carried through her studies in international development at the University of Guelph, to international volunteer trips, and an internship with Right to Play in northern Ontario, where she implemented youth summer camps in First Nations communities. Since it launched in the fall, We Matter has reached over one million people on social media, with hundreds of thousands of shares and thousands of comments on the campaign’s videos. “There’s been an outpouring of support from across the country,” says Redvers, who recently shared the stage with Canadian singer and songwriter Jacob Hoggard at WE Day in Toronto. We Matter started with 22 videos pre-filmed before launch — but the biggest aspect of the campaign is that people can upload their own videos, stories, poetry and artwork. “It’s a way for anyone — non-Indigenous people and allies too — to get involved. People have been waiting for something like this and they’ve jumped on the opportunity,” says Redvers. The campaign has already doubled its videos, with contributions from the likes of award winning Métis writer Joseph Boyden; the first First Nations woman elected to the British Columbia legislature, Melanie Mark; First Nations comedian Don Burnstick; Canada’s Minister of Indigenous and North Affairs, Carolyn Bennett, and Cindy Blackstock, an influential voice for First Nations people in Canada. Redvers and her brother’s short-term goal is to share the We Matter message with high-risk communities lacking strong Internet connection. We Matter also includes resources on its website, such as helplines available throughout Canada, for Indigenous youth contemplating suicide and going through other struggles like drug addiction and depression. In the long term, Redvers and her brother want to start community outreach with Indigenous youth throughout the country. “The possibilities are endless,” she says. “We’ve been in talks with Kids Help Phone about setting up the first national Indigenous crisis helpline in Canada.